With the approaching holiday season, Chevrolet today released a survey through online polling service Harris Poll that reveals what brings parents the most stress on family road trips. The results, which surveyed 1,063 U.S parents of children under 18, indicated traffic as the highest stress inducer. Additionally, 56 percent of participants indicated that in-vehicle technologies such as Wi-Fi and internet connectivity improve their family road trip, and that the ideal road trip length is about six hours. While 93 percent of parents say they love road trips with their families, the survey depicted traffic as the leading cause of stress during road trips (63 percent), followed by keeping their kids entertained (31 percent), and “are we there yet?” questions (26 percent). The top reasons for America’s love affair with family road trips? Chevrolet and Harris Poll find that spending time with family (80 percent) ranked as parents’ favorite thing about road trips, followed by exploring and stopping at interesting locations/destinations (69 percent). Participants of the survey indicated they bring at least 6 mobile devices on their road trips and 63 percent preferred an SUV vehicle. “The vehicle is the new family dinner table, where memories are created and bonds grow strong,” says Steve Majoros, director of marketing at Chevrolet Cars and Crossovers. 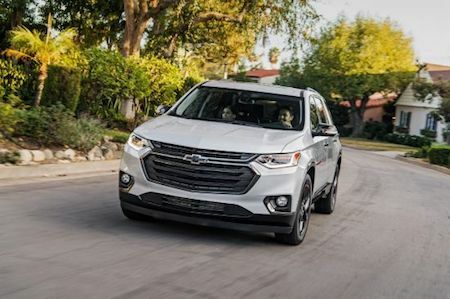 The automaker says it offers several vehicles like the 2018 Chevrolet Traverse and Equinox to meet the needs of parents that offer storage space to USB outlets, available 4G LTE Wi-Fi and Apple CarPlay and Android Auto2 compatibility. Full survey results can be read here.